“The nation was changing in 1970, when President Richard Nixon decided to go with an all-volunteer military, a move that would change recruiting and retention in ways unseen. Women’s issues were front and center even as the Equal Rights Amendment was being debated in the halls of Congress. Chaplain (Maj Gen) Roy M. Terry, Chief of Chaplains, administering the oath of office to the Air Force’s first woman chaplain, Lorraine K. Potter, at Bolling AFB, DC on September 27, 1973. “Into this milieu two years later came a letter inquiring about chaplaincy from a young American Baptist woman pastor. Her letter was dismissed with the note that among the other requirements, candidates must be male. Within two weeks of her initial form letter rejection, the Rev. Lorraine K. Potter received another letter advising her that in the meantime, the Chief of Air Force Chaplains had deleted the requirement that chaplains must be male. “Throughout that decade, the feminist movement moved through our nation with varying degrees of success. The more conservative cultural institutions responded more slowly, if at all, and that meant that churches and synagogues were overwhelmingly filled with male priests, pastors and rabbis. The communities of faith did not go untouched by the new opening of all professions to women; however, and slowly and steadily females mounted pulpits, ministered to the sick and dying and found themselves leading ancient communities of faith in new ways. “When she was sworn in at Bolling Air Force Base on September 27, 1973, Rev. 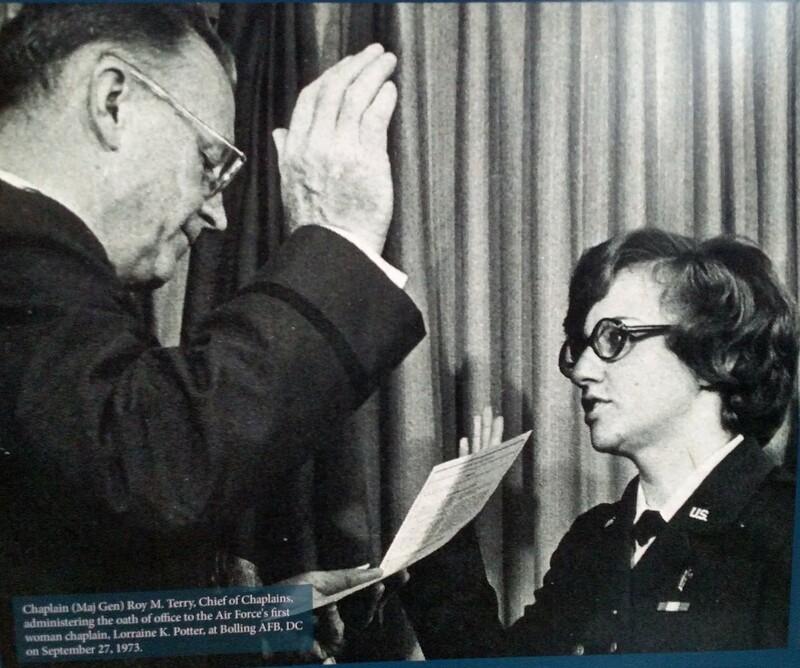 Potter became the first woman to serve as an Air Force chaplain (literally one in a thousand). By doing so she opened the way for clergywomen of all faiths to freely follow their callings as Air Force chaplains. “Over the next five years, six other women would join her in the chaplain ranks, including the first African-American woman. 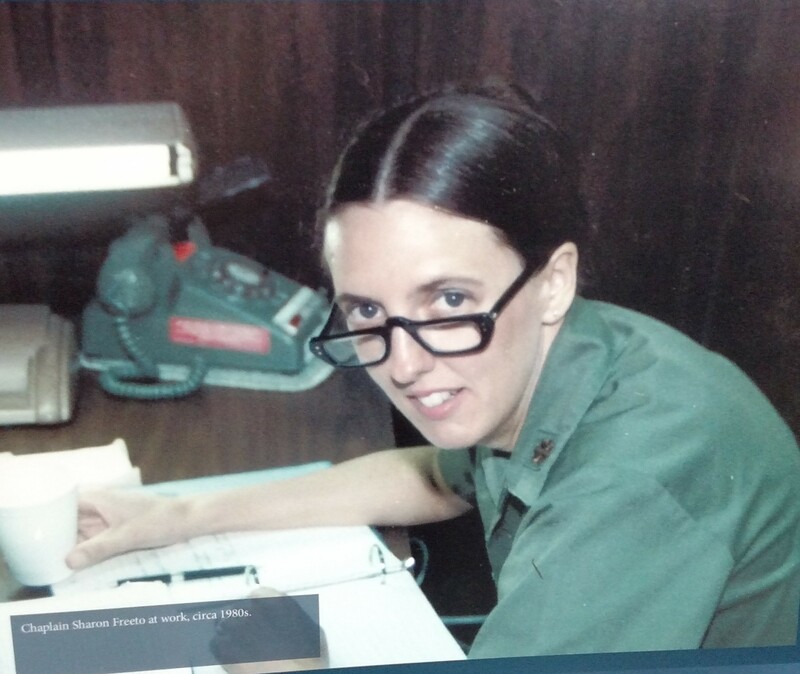 Chaplain Juanita Elizabeth Carroll in 1978. By 1980, four more women came onto active duty, swelling their ranks to 11 women our of a shrunken Chaplain Corps of 843, making women 1.3% of active duty chaplains. “Over the four decades since that first letter of inquiry, women chaplains have served on chapel staffs all over the world, including remote sites. During Desert Storm, Chaplain Cherri Wheeler became the first woman chaplain to serve in a combat zone. Chaplain Wheeler later went on to become USAFE Command Chaplain. 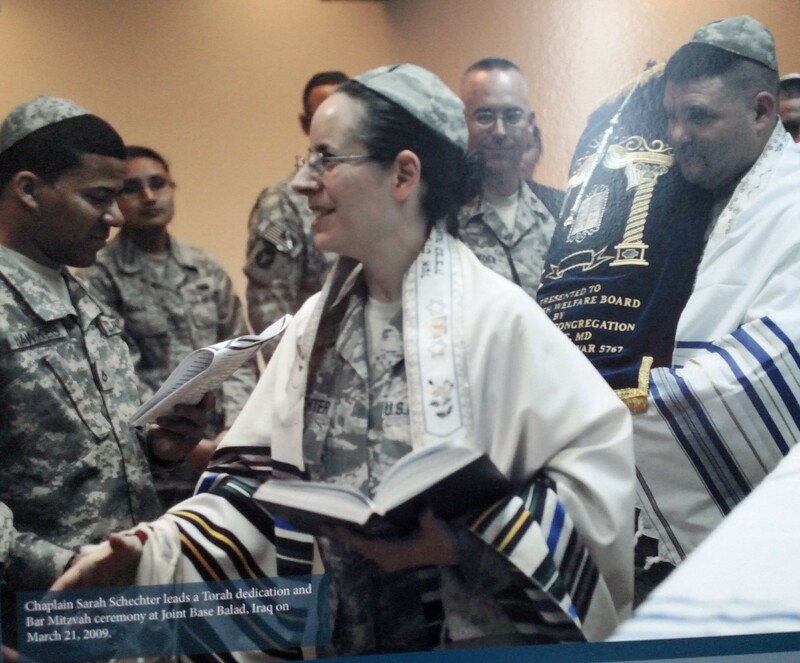 Chaplain Sarah Schechter leads a Torah dedication and Bar Mitzvah ceremony at Joint Base Balad, Iraq on March 21, 2009. Chaplain Jamie Martin gives the invocation to Women Airforce Service Pilots members and guests at a ceremony March 9, 2010 in Arlington, Va., to honor the 38 WASPs who lost their lives in the line of duty. 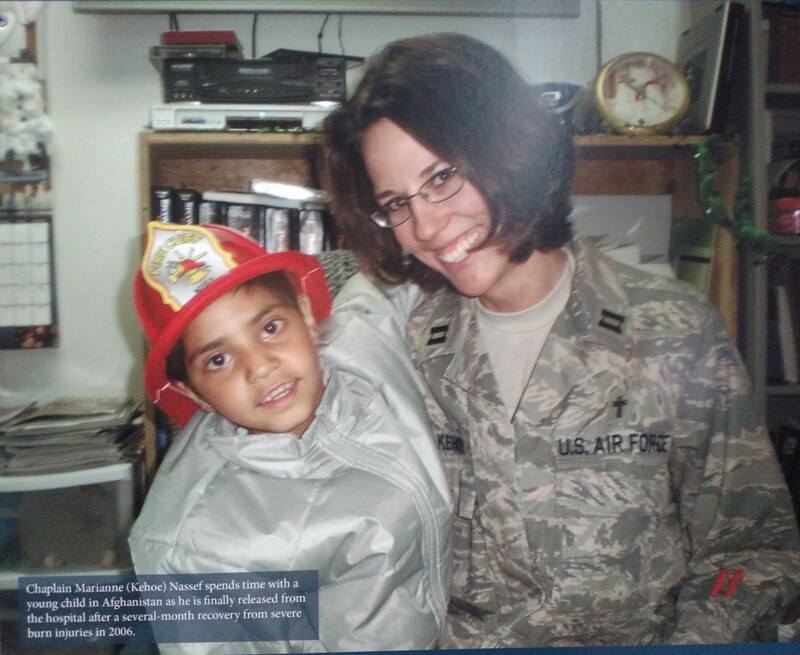 Chaplain Marianne (Kehoe) Nassef spends time with a young child in Afghanistan as he is finally released from the hospital after a several-month recovery from severe burn injuries in 2006. 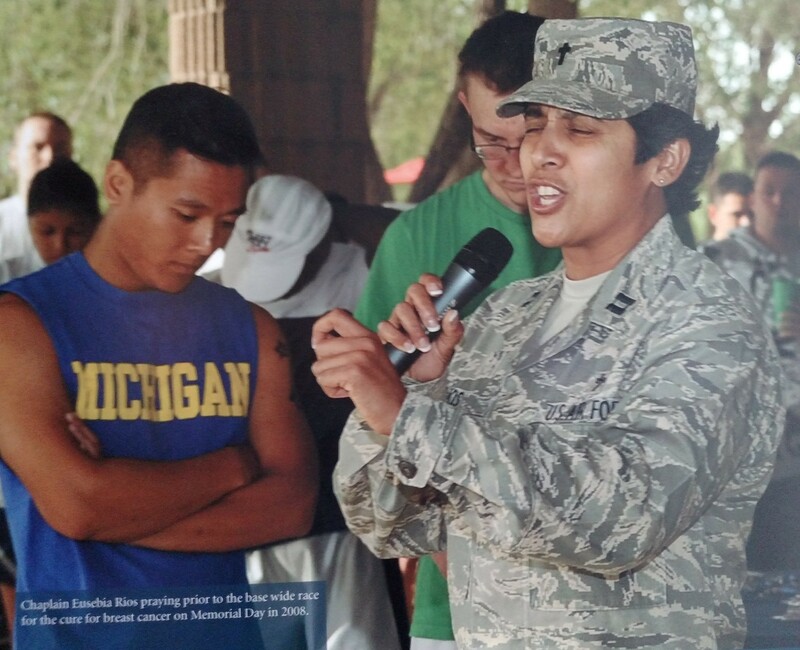 Chaplain Eusebia Rios praying prior to the base wide race for the cure for breast cancer on Memorial Day in 2008. 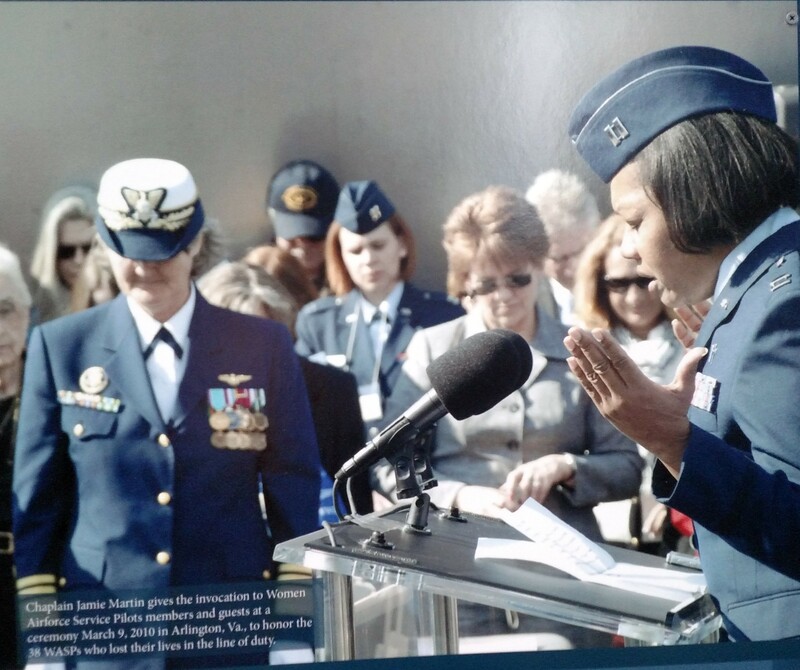 1 Narrative and photos from the Women Chaplains’ display at the Women in Military Service for America Memorial Museum at Arlington National Cemetery, Washington, D.C.